Mick Fleetwood with the House Shakers on Maui Friday, August 1, 2014. 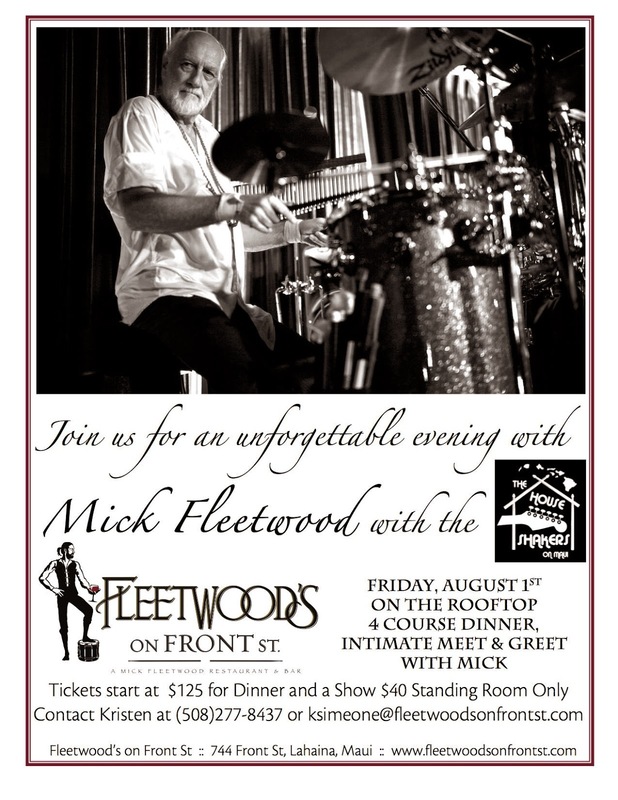 Mick is scheduled to perform on the Fleetwood's on Front St. restaurant rooftop August 1st with the House Shakers on Maui. The show includes two options for tickets. $125 includes a 4 course dinner plus the show, plus an intimate Meet and Greet with Mick himself. There is also a $40 option that is for Standing Room Only. Well, one things for certain... Mick will still be on Maui August 1st. Fleetwood Mac rehearsals are scheduled to start in early August presumably in California.... unless everyone is heading to Maui, which I doubt.